Here’s a great example of the wrong way to handle a tricky pedestrian crossing in your town. 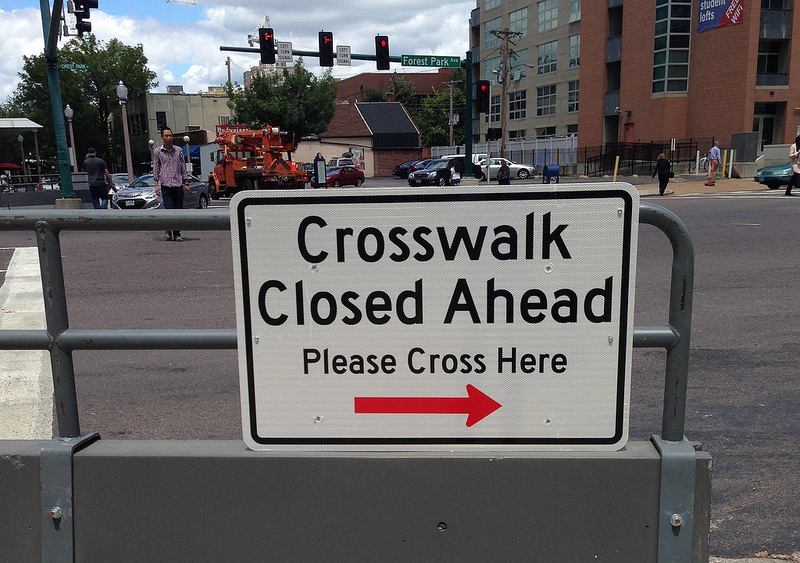 At the request of a local hospital, the city of St. Louis recently removed a frequently-used crosswalk for at least the next two years, apparently in conjunction with nearby construction. The city didn’t just scrub away the markings — to completely ensure that pedestrians get the message, it installed a barrier and even posted a police officer at the location. We’re petitioning for the crosswalk to be returned immediately, a pedestrian study to be conducted, and added pedestrian infrastructure to be added to this intersection. Input from those using the intersection should be considered and their voices included in future planning, as well as interim solutions. For some reason, “temporarily” inconveniencing pedestrians for two years while ensuring a clear path for cars appears to be the perfectly acceptable default. Even before the change, the intersection did its best to repel pedestrians. Some refer to the harried crossing as the “Barnes Dance.” The pedestrian signal crossing Euclid is on a 2 minute and 45 second cycle. The Forest Park pedestrian signal is on a 3 minute cycle. This means that with the west side crossing removed, a person wishing to travel from the northwest to southwest corner will spend 8 minutes and 30 seconds to cross. Eight minutes and thirty seconds to navigate a city street intersection at a busy pedestrian crossing. Forest Park Avenue carries nine traffic lanes on the east and west sides of the intersection. The problem here is in no way that cars lack space, or that pedestrians occlude traffic, but that clear, basic, functional infrastructure for anyone not in a car is ignored. “Improvements” like this demonstrate that neither the city, nor the entities at the medical campus really care about pedestrians and the urban environment. About 125 people have signed the petition so far. Elsewhere on the Network today: Sam Newberg at Streets.mn talks about how he experiences “induced demand.” Wash Cycle notes that DC drivers continue to park in bike lanes, despite receiving more than 6,000 tickets. And Bike Portland interviews an intermodal freight expert about where bike projects should fit into the “Connect Oregon” funding program.